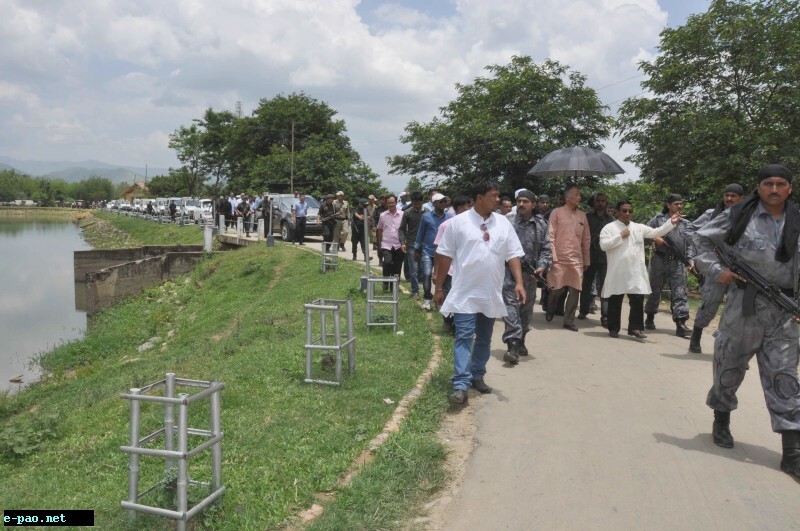 Imphal, June 04 2014: Chief Minister O Ibobi Singh on Wednesday went to inspect the Kaina Shri Shri Govindajee Temple Tourist complex and Andro Santhel Tourist spot. Talking to media persons on the sideline of the inspection visit, Ibobi said that these two tourist spots are to be developed with funding from the Union Ministry of Tourism and North Eastern Council (NEC) . The development of the temple complex at Kaina which would include a water body would be funded by the Ministry of Tourism while NEC has already given the approval for funding for the development of the tourist spot at Andro Santhel, the Chief Minister said. He further informed that the Pony Sanctuary at Heingang in Imphal East district and Kheba Ching at Khongjom are also being developed as tourist spots. MLA of Andro A/C Th Shyamkumar, former MLA Dr Kh Loken Singh and Principal Secretary in-charge of Tourism Rajesh Kumar were among other officials who accompanied the Chief Minister during the inspection visit.